Case analysis : Am I ready to start this ? This reading was done in order to see if it was wise to start a project related to the studies one has made. The project is definitely on the way, but one was wondering if it was not a little bit too early on. This project implies feedback from other people. The spread used for this reading was the horseshoe spread using 7 cards. The question : Am I ready to start this “undertaking/project” on “that day” ? Here are the cards and below the analysis of the spread. This was so accurate : the perfect card to illustrate what’s been going on for several months now. A person totally devoted to his task, learning to perfect his craft, gathering knowledge and being committed to master his techniques. The process was a long effort. And the person feels very concerned and is a perfectionist. The Star testify that a level has been reached, that is making one fulfilled. The creativity and spiritual side of the card Star is here appropriate as well. It shows the hope and the faith in the project. The card for the future says that there is a next level to reach. One has to go beyond the superficial and tackle with some more work. The time for being satisfied is not there yet. It also says to keep working before sharing the idea of the project. This one seems to say there will be no feedback yet. Or there will be no participation. Indeed, this project involves the participation of others, so it seems to fit. Some lack of interest. It may also show the hesitation of showing the project to other people right now. 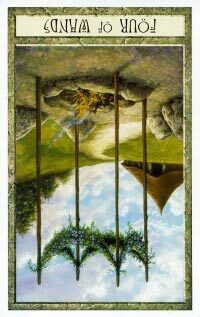 The will to test the potential, the tools one has learned to use with the 8 of pentacles. The Magician is looking forward to start the project. The two cards being reversed it shows immediately that the answer is most likely no, it is not wise to kick start the project at the date given. Some delays are ahead, maybe not much though. The 2 cards simply shows some nervousness around the question that might get in the way of leading this project to completion in the best conditions available. The best way to go is analyzing priorities, getting prepared in a better way, and gaining more self confidence before starting the project. 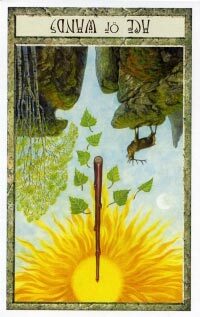 As I shuffled the cards, by the way, the 8 of wands reversed fell from my hands : already, that was speaking of some delays. Nothing too wrong here, just some more time is needed for the person to be more assertive. The Star and the Magician are two very positive cards for the project. The others speak more about nervousness, but they certainly don’t imply the project has to be rebuilt from the start. 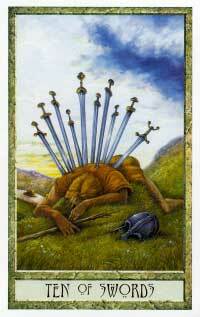 The character is the 10 of Swords is someone who seems to have lost all faith in life. He looks defeated, if not dead in the card. He has been through a battle, or maybe has been stabbed in the back. Whatever the reason he has hit rock bottom. He is laying on the ground, looking defeated. He looks like he shall never rise again. The whole set of the card looks like a place devastated after a war. It definitely speaks of a cycle in life being coming to a close. The situation might not be actually as bas as it seems, though it may hurt a big deal. Simply put, it may sometimes represents someone with a victim personality. But sometimes as a situation is difficult to accept, we are that character : hurt, hopeless, wounded emotionally. Feeling totally crippled and not willing to keep on going. Post traumatic syndrome may be indicated here, as well as identity crisis following a nervous breakdown. This is someone who need his/her self-image to be rebuilt from the ground so to speak. The Star is kneeling, one feet in the water and one feet on the river’s edge. She can be seen as taking the water from the source and giving it to the earth. The whole card speaks about quietness, a time of peace, a time of hope. Serene, she is diligently working at her task. This card speaks about harmony. Her world seems to be full of promising opportunities that the 10 of Swords is lacking. She is choosing to see the positive. She looks faithful and resilient. 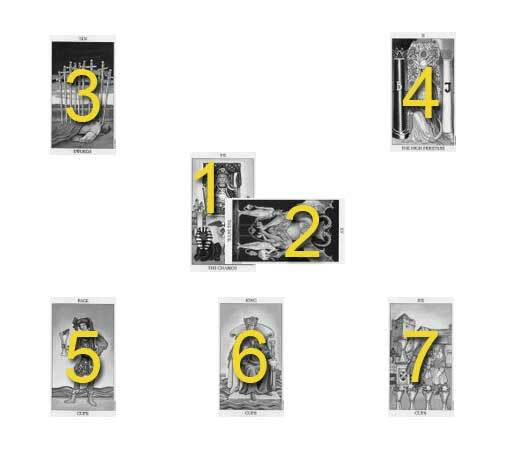 Not to say that her life has been easy all the time : this Major Arcana is following the Tower which speaks of a shock, a upheaval of some kind. So she represents someone who can see the light through the darkness and learn from her trials and tribulations. A renewal of the soul. 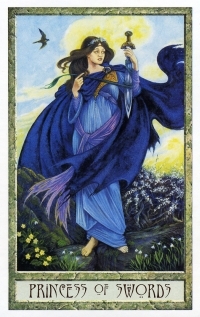 Now that the Tower in the Major Arcana collapsed, she has learned what was wrong in the foundations and she starts again, building on a better ground. Indeed, when you place the “10 of Swords” and on its right “the Star” : it looks like the character in the 10 of swords has reached the shore, exhausted and that the Star is there to bring him her soothing presence. He seems to say : I resign, I surrender, please take good care of me, I feel like dying. And she pours the curing water, like a cure on his wounds represented by the swords on his back. Indeed, I have read some place that the 10 Swords were placed not “accidentally” where they are : they are related to the chakras of the individual, and the kundalini. I’m no expert on this particular topic, but I do intend to read about it, even before looking at the 10 of Swords, it has “piqued” my interest anyway … Still speaking of healing and remedy : it looks like acupuncture right ? What should be reminded here too, is that in the card “10 of swords”, in most decks, there is a dawn coming up. The sun is sometimes seen behind the clouds in the sky : reminding us that there is still hope, life is not over yet. 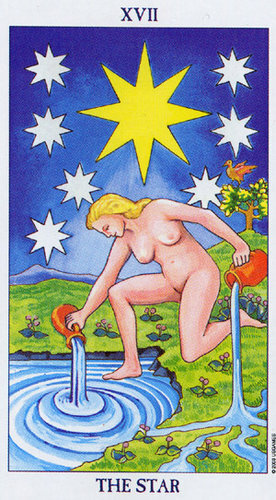 The renewed sense of purpose is represented by “the Star”. 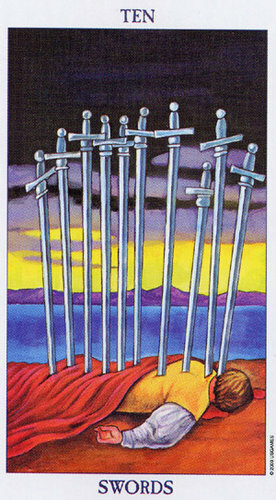 Just as in counseling, he has to be willing to cure himself, the presence of the Star means there is a possibility but the character in the 10 of swords has to turn around. He has to give up his victim mentality. You have to be willing to make the first step. No one can cure you unless you are willing to participate in the healing process. The psychological attitude is very important when going through such a process. Feeling hopeful is already the first step towards better time. Only then you allow the bringing together of higher energies. Here below, these two cards from the beautiful Druidcraft tarot deck. I found this poem by Ralph Waldo Emerson, which is, reflecting in its own way one of the meaning you could associate to these two cards one next to another. Here is a little case analysis. Someone trusting my inner voice, my intuition. Learning about spirituality. Developing potential that might be currently hidden, but growing nevertheless. As I am currently trying to develop my tarot skills, and willing to develop this blog, I’d say this is a good omen, to have the high priestess coming up. Things are going to place at a very fast speed. What I don’t know about myself is the fact that this can be stimulating in a very big way, whether it is for myself, or for someone else. I should stop being so anxious and be more relaxed about my path. After a period of difficulties, it is about time I realize my head is above the water now. Troubles are behind me : I am not fully aware of it though. I should test my techniques, and be relaxed about it. I might be too much focusing on details, and should look about the whole picture. I should question my motives as well. I wish I was more critical and develop a better sense of self-esteem. The fact that this card is reversed shows my hesitation, my fear of letting go. But I definitely wish to feel free from restrictions. I am having trouble concentrating on my goal. Indeed, things have been all over the place recently, and I had very little time to accomplish what I wanted at the level I wanted to reach. I have yet have to remind myself that one day only consists of 24 hours, period ! I am just restless. I am going to heal from previous hurt. And not feel so much on my guard. I won’t be as anxious as I used to be. A battle will be won. 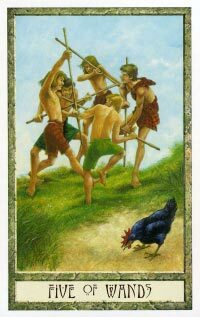 So even if this doesn’t speak of a celebration, relaxed time such as in the 4 of wands card, it is still a good card to get. I will feel involved in my battle as I go on my path. The Fool is a merry character, innocent and not always realistic. Unaware of the danger and pitfalls that might be on his path, he is willing to take changes. He is looking for novelty. 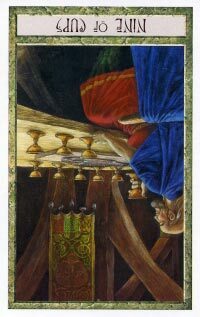 The card displays the Fool basking in the sun. The character on the 8 of cups in on a journey as well. He is not facing the cards. Actually we don’t see his face, as he is walking towards the background. This character is on a quest, as he is in the need of something new in his life, just like the Fool. The Fool might not necessarily feel the need for novelty but he is experiencing them. The Fool is cheerful, the one in the 8 of Cups has learned a lesson in his life, and maybe the hard way. He has grown dissatisfied with a situation and decides to leave it behind. The Cups in the foreground represent all he has experienced, acquired in his life path that no longer represent something interesting to him. Indeed, the colors in the card are not cheerful as in the Fool card, much darker. it is a card that shows transition and maybe not such a cheerful period. The Fool character is somewhat unconscious, and therefore because he doesn’t spent his time thinking about the risks he is taking, he has the opportunity to discover new horizons in a very light fashion. 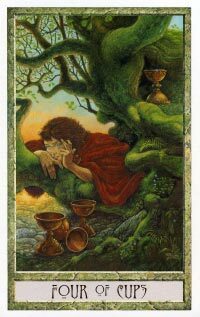 On the contrary, the character in the 8 of Cups is aware of all the trouble he has been through. The Fool is at the beginning of a journey, the 8 of Cups has been through some experiences already and he is learning and pondering about the consequences. 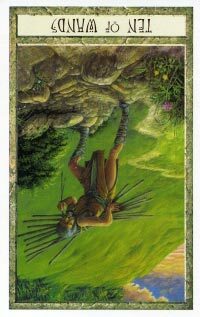 He is questioning himself, the Fool is trustful and having fun as he strolls about on the cliff. He is not at the beginning of a journey, more on the way, having some experience already. He is not a foolish, innocent individual anymore. If the Fool might represent someone careless, then the 8 of Cups might represent some burden. About the design on the cards : they both have sticks. 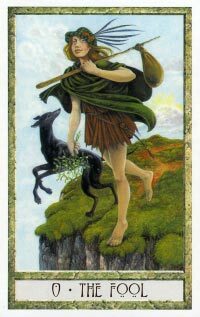 The Fool carries his stick on his shoulder, the 8 of cups uses his stick to help himself climb the mountain in order to get away. The Fool seems to be jumping about, his eyes are looking in the sky. The character in the 8 of Cups is walking, eyes on the road he is taking. He also seems to be in a colder environment as he is wearing a coat to wrap himself up. 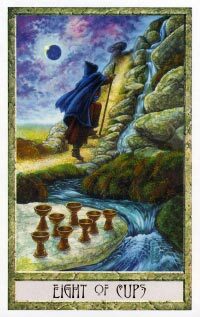 The river in the eight of cups represent the feeling lost/left behind, as water is associated with feelings and emotions. The Fool is living the moment, the 8 of Cups wants to seek what is next. The Fool suggests vitality and the 8 of Cups is more in the vein of persevering on a quest, leaving stuff behind on purpose. They both share the idea of going into a new territory. The spirit is very different though. Thinking about reincarnation for example and applying that to those 2 characters : the Fool is the soul as it steps into his/her incarnation in this life; the 8 of Cups is someone aware of his karma, learning his lessons, as a period of his life is ending and before he goes to the next level. The Fool is taking whatever that comes, the 8 of Cups is leaving unnecessary stuff behind. The Fool is reaching out, enjoying what is “alive”; the other one is looking in, and dropping what he feels is “dead”. A while ago I read an interesting post on Aeclectic Forum about a member who was questioning her deck in order to see how they could work together, and I just thought that was a brilliant idea. So simple, and I’d never thought of it. Just like hula-hoop. Simple and it keeps you busy for hours. I (the deck) will help to relieve the burden, so you can climb that mountain. So get rid of your fears, finish the tasks you have at hands right now, and get in there to climb the mountain …. There is quite a wonderful sight up there. The meditation card, the one that helps to go within. As 4 stands for structure and cups for feelings, emotions … The deck will be useful for putting things into perspective. Be a good support for emotional matters. I know already with reading, the other 3 are what I yet have to discover. The deck will give me good psychological insight, or help me to improve it. In the card there is a campfire and behind it closer to the horizon, a home. Does that mean that the deck will be limited for people out of my home ? So that it is solely dedicated to people online-readings, as I had in mind ? It seems to say, there will be no easy trick with me, I’m no magic wand, you’ll have to remove those blockage you might have within. As a woman, I’m pretty much a wand type, I’d say. This card reversed seems to imply that I’ll have to master my energy, and not let my energy master me.Which is oh so true anyway. This seems to me the easiest one to understand within this spread, you have to jump in, deal with other people, struggle, voice your opinion, and confront yourself with others , (as in the reading exchanges forum On Aeclectic Tarot) . There is a little hen in the foreground picking up seeds from the ground. My translation : I will feed my soul while struggling with readings, or I will feed my soul helping out people who are struggling with some problems and thus asking for a reading, both could be accurate. In the card there is someone who seems to be waiting in front of a table and he’s alone in the card, with many cups for other people that might come to his table. Making some more researches and brainstorming with that card :it also implies the rejection of “surface” values, one has to be prepared for his/her mind to move on and look for a true victory and liberation. A sign of greater awareness. Any insight is welcome, really. And remember, Aeclectic tarot forum is quite the place if you wish to learn about tarot. I just bought myself a brand new deck : the Druidcraft Tarot deck ! I just couldn’t leave the shop without it. The visuals are just beautiful : you don’t get the feeling the artist focused on the Major Arcana and overlooked the Minor Arcana as it is sometimes the case. What I also love is that the meaning of each card is strongly related and inspired by the classic RWS. So if you have experience with a classic deck, the transition isn’t hard to go through. Yet it offers a lot of details when it comes to symbolism. What I like most : the design of each card, you feel like entering the card and exploring its world, like it is a movie you want to watch over and over again. It is very inviting, the colors are rich, details are well designed, the characters have personality and seem very human. The trees and forest are just beautifully rendered in luscious colors. I tend to dislike the Emperor (Major Arcana 4) in the classic tarot deck, and I love the one in this deck. One difference is that the Page are called Princess in this deck. What is really nice is that having a brand new deck you tend to discover each card all over again. You notice details you might have overlooked previously. And along with the deck, there was a well written book (in sepia tone ) with explanation about each card and also some suggestions for layouts. The book is offering insight on every card with keywords to relate easily and very thorough. I spent several evenings looking at the cards with a notebook on the side, jotting down ideas and feelings, making combinations and such. The cards are bigger than the deck I usually use so this takes some time to get used to. But the design of each card is so compelling, It’d be a shame to be printed on smaller cards. I think that in the next few weeks, I’ll use this deck quite often as it is giving me inspiration and new insights. It is a very fresh alternative from the RWS I used to work with.